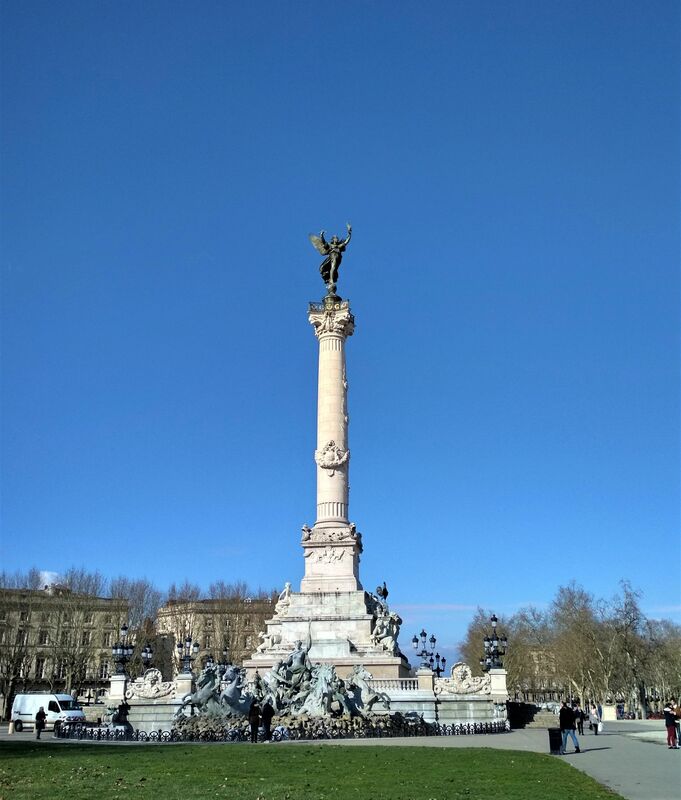 Right in the heart of Bordeaux, Place des Quinconces is one of the largest city squares in Europe, decorated with 19th century monuments and fountains. 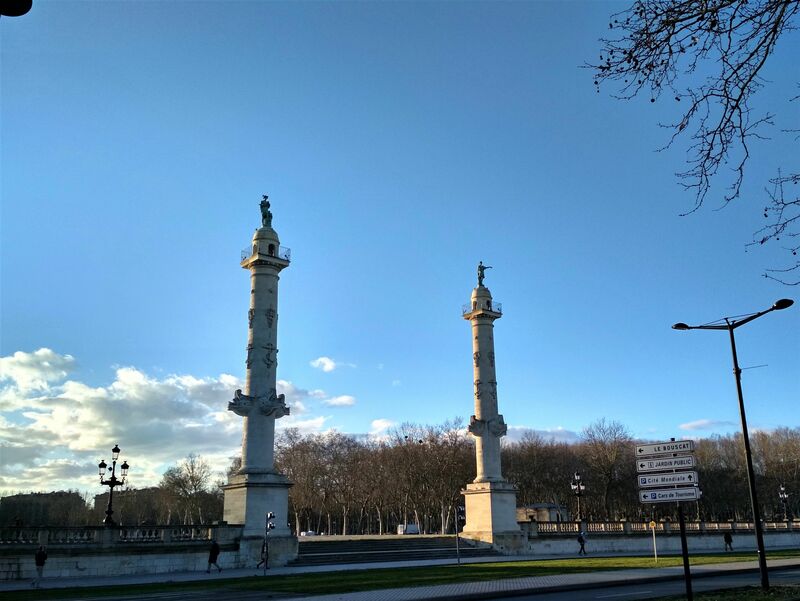 Bordering the river Garonne, this square is named after the arrangement of the surrounding trees, which were planted in a “quincunx” (or five points arranged in a cross in English) . The square was built between 1810 and 1828 on the site where Château Trompette once stood. It was a bit of a power play by Louis XVIII because he wanted to demolish the previous ruler’s castle and assert his authority as king. The result was Place des Quinconces, a 12 hectare public space. There are two 21-metre victory columns alongside the steps leading down to the river from the square, representing the mastery of the seas. 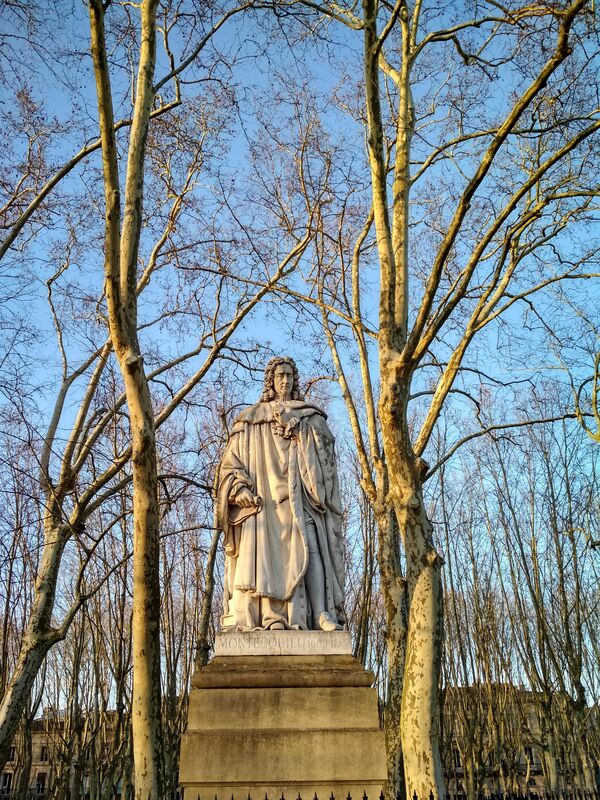 On the square you can’t miss the colossal statues dedicated to Bordeaux philosophers Montaigne and Montesquieu. 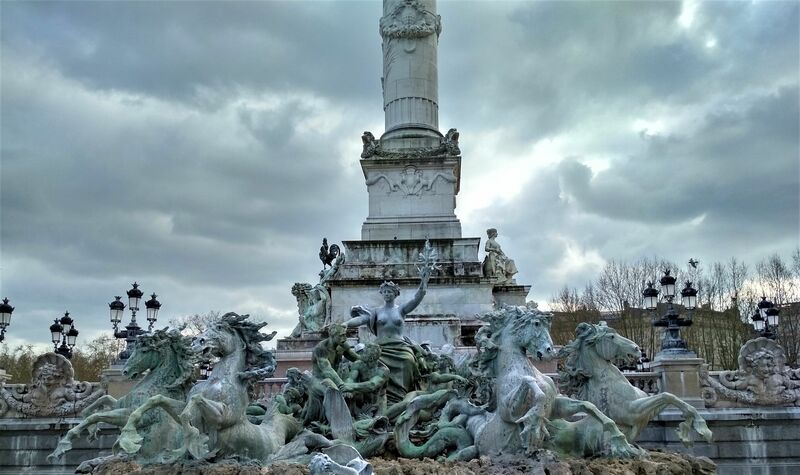 However, the Monument aux Girondins, on the other side of Place des Quinconces is the most impressive monument. 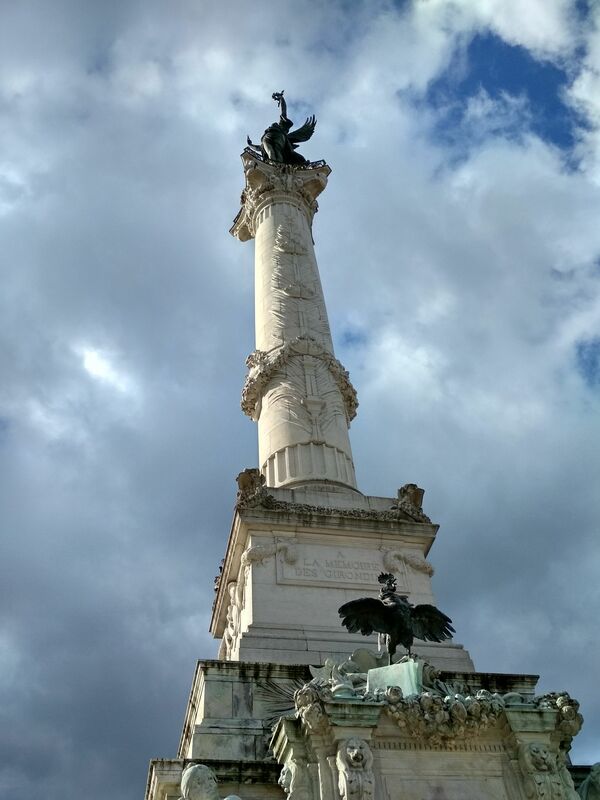 It was erected between 1894 and 1902 in memory of the Girondists who were executed during the French Revolution. They were a group of moderate, bourgeois National Assembly deputés, (members of the French parliament) 29 of whom were executed in 1793 after being convicted of counter-revolutionary activities. 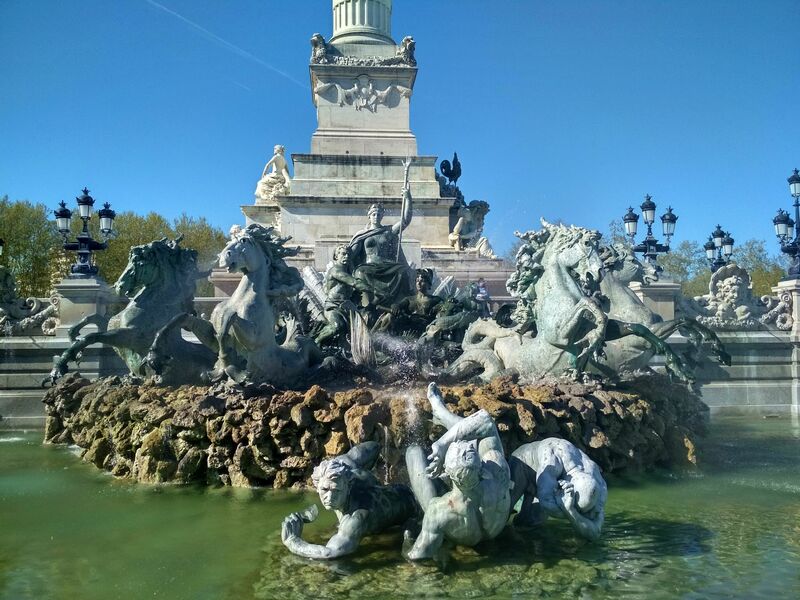 At the base of the monument is a fountain with a bronze statue of a chariot pulled by four horses symbolising happiness. Ironically figures representing Bordeaux, Dordogne and Garonne are included in this installation but not Gironde or the Girondists. Ah well, the grand 50-metre column topped with a bronze statue of “Liberty breaking its chains” will have to suffice.